In Avatar: The Last Airbender, the underlying language is Classical Chinese. The characters are Chinese used in the Classical Chinese format. The Chinese language format evolved and changed over a long period of time, and Classical Chinese format is very different from contemporary and spoken format. Nowadays Classical Chinese is rarely used (and only in literature) and considered as a proper form to Chinese, just as the Latin or Shakespearean language is to the West. Classical Chinese is primarily a writing form. It is very hard to learn and understand because it is a very condensed form -- it uses the fewest possible characters to express very comprehensive meanings, and the specific meaning is almost entirely dependent on the context. That is because in ancient China, paper and writing equipment were expensive and rare so people had to be economical with the language. The 1st character means "to fall", "to come down", or "to descend". The 2nd character means "age", "generation", "era", "world", or "lifetime". In this case, the verb (i.e., the first two characters) is placed in front of a noun (i.e., the next two characters) so the verb becomes a modifier. The 3rd character means "God" or "divine spirit". If it is used as a descriptive modifier (i.e., adjective) it means "divine", "mythical", or "magical". The 4th character means "to connect", "to communicate", "to commune", or "to bridge". The 3rd and 4th characters, together, usually mean a "medium", a person with the gift to contact spirits. In the context of Avatar, the phrase also means a "divine being" who is also the "great bridge guy". By the way, the phrase is always used to describe a mortal being with divine power. It is never used for an immortal being in spiritual form. So, all four characters combined mean "the divine medium who had descended upon the mortal world", implying that he/she used to be a higher spiritual being that had taken on a physical, mortal form. EARTH - The first character is "Earth". The second is "Strength". So the form means "Earth is Strong." FIRE - The first character is "Fire". The second is either "Ferocity" or "Intensity". So the two characters together mean "Fire is Ferocious" or "Fire is Intense." AIR - The first character is "Air". The second character is "Peace", "Harmony" or "Gentle". So their combined form means "Air is Peaceful or Harmonious". In terms of the fighting style, it means that "Airbending is a (Soft and) Gentle art." At the top and bottom are two separate rows of four Chinese characters in Classical form. 1. The first character means either "Collective", "Group", or "Aggregate". 2. The second means "Hero", "Remarkable Individual", or "Leader of Men". Combining the first and second characters (1 + 2), the form means "the collection of leaders." So, it means the "Powers" that lead the world. 3. The third character is the Chinese number "Four". 4. The fourth and last character means "Divide" or "Separate". The third and forth characters combined (3 + 4) mean "divided into to four." So, the top-row four-character sentence (1 + 2 + 3 + 4) means "Powers are divided into four fractions." 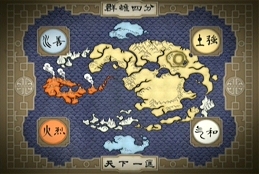 The four fractions are, of course, Waterbenders, Earthbenders, Firebenders, and Airbendrs. 1. The first character is "Sky". 2. The second is "Under", "Beneath" or "Down". The first and second characters (1 + 2) form to mean "everything under the sky." That is a common usage to mean "the world". 3. The third is a number, "One". 4. The four and last means "Rectification" or "Guidance". The third and forth characters (3 + 4) form the meaning: "under the guidance of one." The one is, of course, the Avatar. So, the bottom-row sentence (1 + 2 + 3 + 4) means "The world is under the guidance of the one Avatar." -Each of the Pair consists of the same number of characters, obviously. -The Pair is poetic and rhymes when being read aloud in Chinese. -The first and second character combinations (1 + 2) in the top and bottom rows are, according to the writing rule, "the same and complementary." The top first couple characters mean "the powers that lead", while the bottom first couple characters mean "the whole world". Notice that they have continual meanings and are complements. -The third and forth character combinations (3 + 4) in the top and bottom rows are "the opposite and supplementary". The top last two characters mean "divided into four", while the bottom last two characters mean "led by one". Notice that they have the opposite meanings but are supplements and have continuity. -Of course, the entire top sentence is complimentary and supplementary to the entire bottom sentence. The Counterpart Pair works in conjunction to explain a single concept.